My niece created the CD art (above). I think we might have a budding graphic designer on our hands! 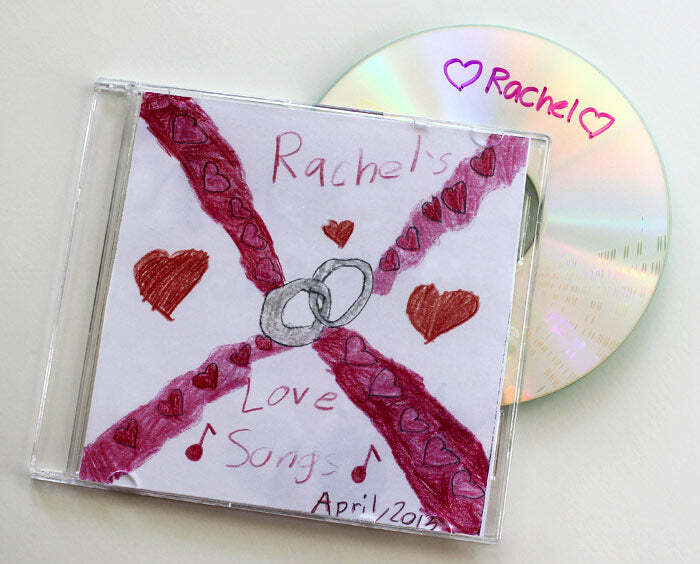 At my bridal shower in Philadelphia, my sister-in-laws contacted the guests before the party and found out their wedding first dance songs then compiled a CD to give out as favors. While Jason and I have already selected our first song (hint: it’s not in the list below! ), it was so fun to see the variety of songs and even more fun to see who picked them! We’ve been listening to the CD while doing wedding-related things like selecting songs for our band to play (which we are doing right now!). 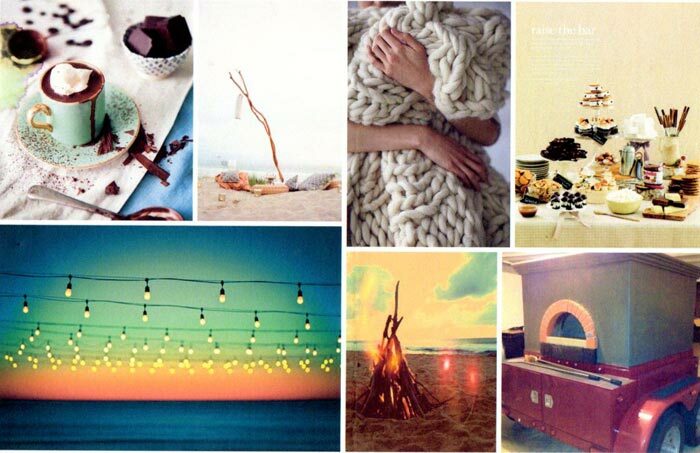 I was immediately in love with the textures — grainy sand, thick cable knit blanket, smooth marshmallow-y desserts. Then I was enraptured by the colors — creamy white, hazy smoke from the fire against the gradient of the sunset. It felt sumptuous yet cozy, casual and inviting. Needless to say, I was incredibly inspired! 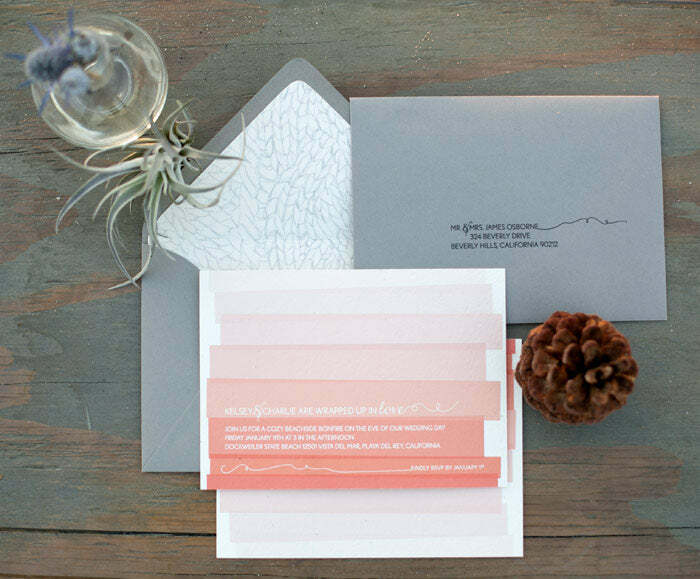 The cable knit from the inspiration board lead to the hand-drawn envelope liner which is contrasted with a graphic interpretation of the sunset gradient on the invitation. Yarn from the cable knit is also referenced with the twirl-y flourishes that accent the text on both the invitation and the mailing address. 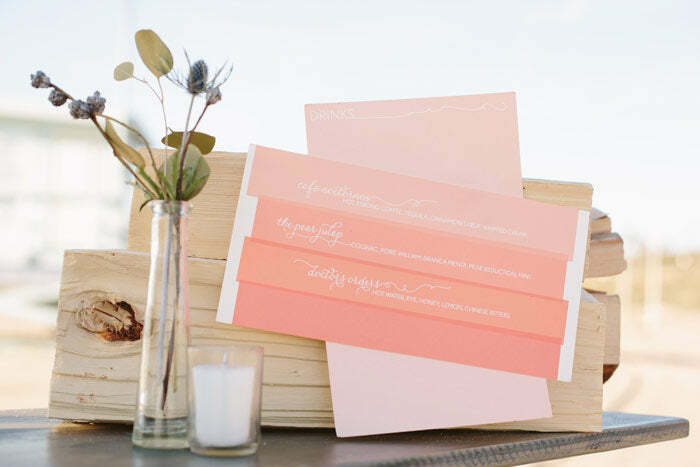 The color palette includes warm tones on the invitation which is then placed into the smokey grey envelope. 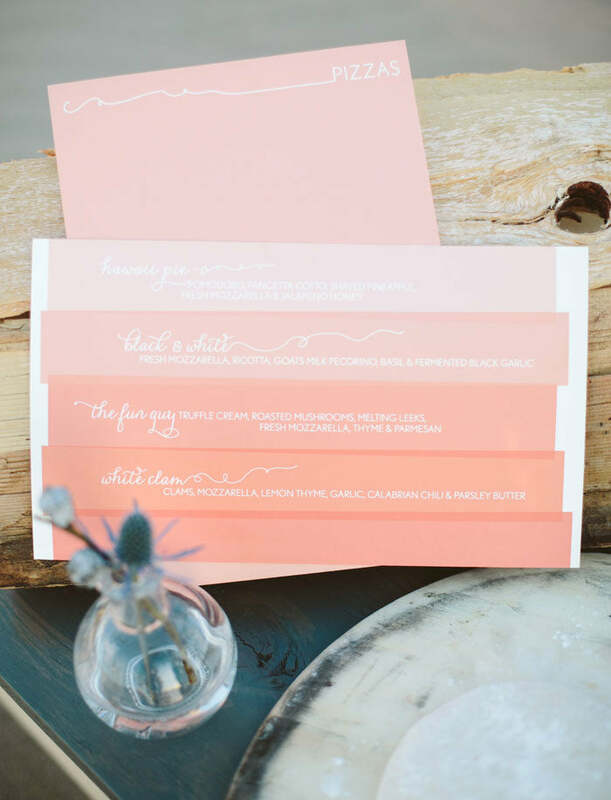 The typographic elements and graphic sunset gradient featured on the invitation were echoed in the menu design. Drinks were skillfully concocted by Pharmacie and pizzas were baked in Urban Pie‘s mobile (yes, mobile!!) wood burning oven. 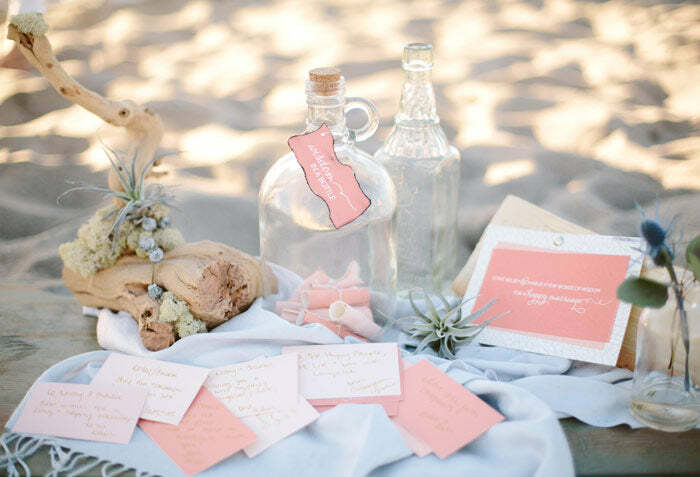 Given that we were on a beach, it only seemed natural for the guest book to take the form of a “message in a bottle”. 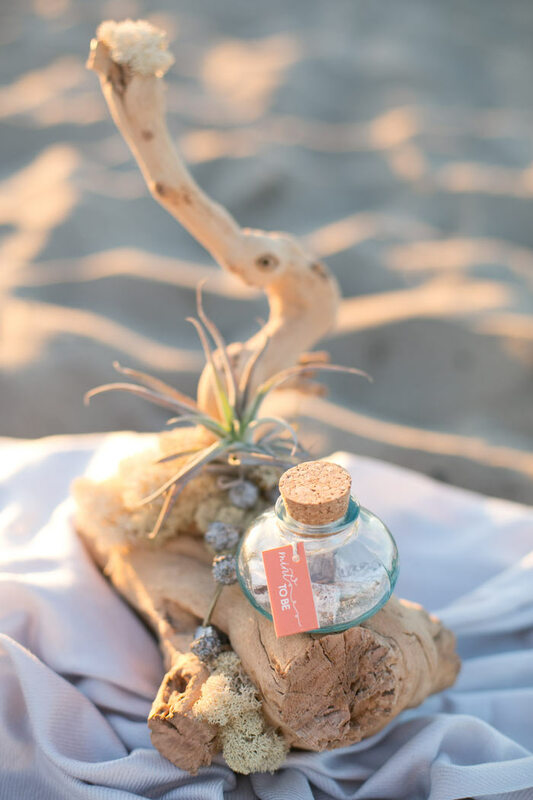 We tweaked it slightly and called it “wisdom in a bottle” encouraging guests to give some words of advice to the soon-to-be-wed couple. To make it a little more authentic, Robin and Sarah burned the edges of the sign hanging on the glass jug to give it texture and lend a little bit of a smokey quality to it. The favors — delicious “Pigments” by Petite Pig — are in a glass jar sealed with a cork and a tag that reads “Mint to be”. Check out the entire shoot from this talented team assembled by GATHER Events and featured on 100 Layer Cake!